Russian Hebraist; born in the first quarter of the nineteenth century at Wilna, where he lived all his life in affluent circumstances. He died there in 1896. 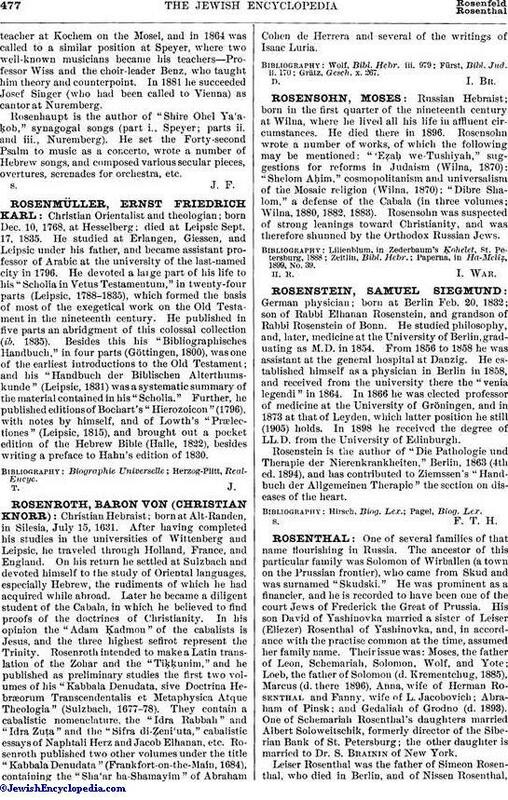 Rosensohn wrote a number of works, of which the following may be mentioned: "'Eẓaḥ we-Tushiyah," suggestions for reforms in Judaism (Wilna, 1870); "Shelom Aḥim," cosmopolitanism and universalism of the Mosaic religion (Wilna, 1870); "Dibre Shalom," a defense of the Cabala (in three volumes; Wilna, 1880, 1882, 1883). Rosensohn was suspected of strong leanings toward Christianity, and was therefore shunned by the Orthodox Russian Jews. Paperna, in Ha-Meliẓ, 1899, No. 39.